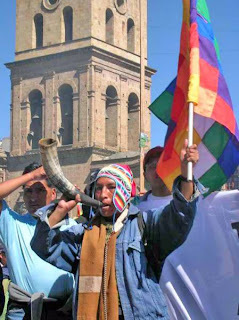 AFP, La Paz — An alternative "people's conference" on climate change in the Bolivian city of Cochabamba in April will seek to advance an international global warming referendum, organizers said. "The only thing that can save mankind from a (climate) tragedy is the exercise of global democracy," said Bolivia's United Nations Ambassador Pablo Solon, a key organizer of the summit. Thousands of people, mostly members of social movements and indigenous groups, are expected to attend the People's World Conference on Climate Change and Mother Earth Rights from April 20-22. Organizers say it is intended to "give a voice to the people" on climate change after the perceived failure of the United Nations-sponsored Copenhagen summit on the same issue. Solon said he expected participants from 94 countries and representatives from 70 governments to attend, without giving further details. Bolivian President Evo Morales, who in January issued an open invitation to the conference to governments, scientists and social movements, has said a number of South American presidents would also attend. But the outlines of the conference remain vague, and it is shaping up so far like something between an environmental forum and a political rally. It is expected to tackle many of the themes Morales raised at the Copenhagen summit last year, including creating a "climate court of justice" and the need to "change the system of capitalist consumerism" -- proposals that could be included in the suggested global vote. Solon said the summit's conclusions would be delivered to the next UN-sponsored meeting on climate change, currently scheduled for December in Mexico.